This is a favorite appetizer of our family. 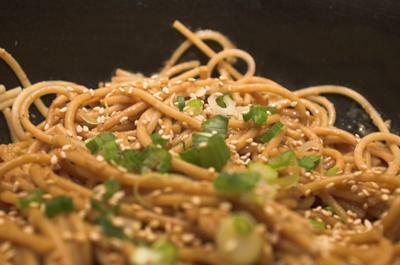 We love peanut butter and it tastes so good in this Asian inspired savory dish. We all love peanut butter a lot our family. To lighten it, I mix it with peanut flour. You get all the goodness of peanut butter without the fat. If you can't find peanut flour, use 1/4 cup peanut butter instead. Optional: Shredded roasted chicken, grated raw carrots, julienned snow peas, red peppers etc. 1. Cook noodles as directed on package to al dente firmness. 2. While noodles are cooking, make sauce. Set aside about 1 tablespoon of the roasted sesame seeds. Puree the rest of sesame seeds, peanut butter, garlic, ginger, soy sauce, rice vinegar, and brown sugar in a food processor or blender until it is the consistency of heavy cream. 3. Drain cooked pasta in colander, transfer to a large bowl and dress with the sesame oil. This will keep the noodles from sticking together. Add sauce to the noodles to taste. Any extra sauce can be passed at the table or used to dress steamed vegetables, shrimp, etc. 4. Mix in optional shredded roasted chicken, and raw vegetables if desired (my boys don’t care for the latter, so I usually don’t). 5. Garnish with scallions and remaining sesame seeds. * Roasted sesame seeds can be found in Asian markets. Otherwise, toast raw sesame seeds in skillet for a few minutes, while stirring. Sounds quick easy and tasty. I'll give it a try.